Eciton burchellii is a species of ant that is considered a eusocial insect. Social evolution trends in insect’s ranges from individual, but yet hard-wired and high-grade processing units, like the European Paper Wasp (Polistes dominula), to simpler individuals with high numbers like Army Ants (Franks 1989). Each colony is made up of over 500,000 individuals. These ants are highly known for raiding and getting their prey using pure numbers (Encyclopedia of Life 2013). Due to their large colony size and carnivorous habits they must often migrate in order to find food for survival (Amateur Entomologists’ Society 2013). 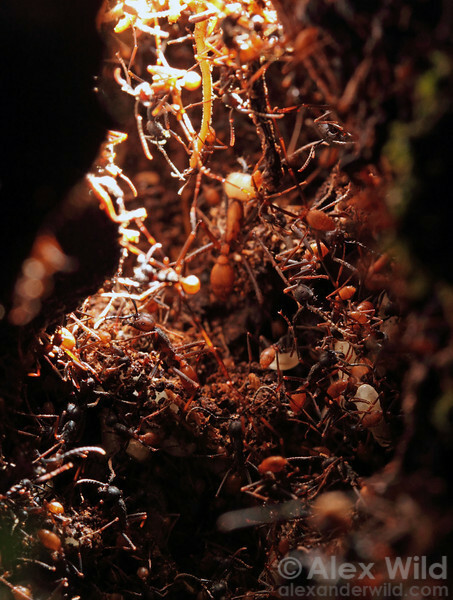 These ants are able to accomplish large goals by individuals spontaneously working together, which is seen when forming bivouacs. scorpions, beetles (like Oiceoptoma noveboracense), roaches, grasshoppers, and many other species of ants (like Atta cephalotes). There have also been reports of larger species falling victim to Eciton burchellii. These consisted of snakes, lizards, and nestling birds (Wildscreen 2013). Most victims are completely engulfed, much like the ants in this video. Some species form mutualistic, parasitic, and commensalistic relationships with Eciton burchellii. 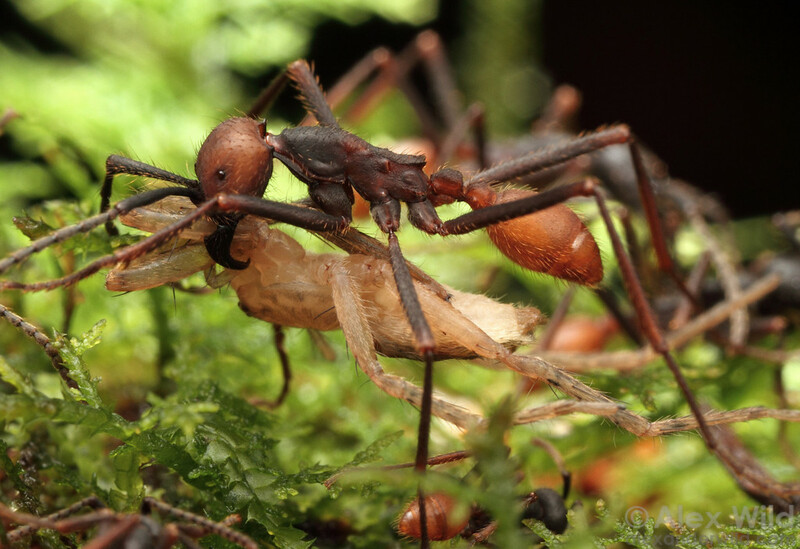 Army Ant raids support a community of diverse organisms, including birds that attend the raids to collect prey(Kumar and O’Donnell 2007, Meisel 2006, Encyclopedia of life 2013). One Army Ant-following bird, Phaenostictus meleannani, uses a series of networks involving mated pairs that have zones to occupy. These birds locate the Army Ant swarms and feed on the raids (Encyclopedia of life 2013). Many other species of birds prey on the arthropods that flee from the raids of E. burchellii. With some species of antbirds, parasitic relationships are made due to the cost of consumption of arthropods. There are around 300 species of bird that rely on the ant for survival and larger flocks of birds make it harder for the Army Ant swarm raids to get food for the colony (Kumar and O’Donnell 2007, Encyclopedia of life 2013). There are hundreds of species that live hand- in-hand with Army Ants. The Euxenister beetle is known to have a specific relationship with E. burchellii. They live in the bivouac and groom workers while feeding off broods. Other species of mites are also found almost every Army Ant bivouac (Encyclopedia of Life 2013, Animal Diversity 2012). When involving humans with E. burchellii, the species does not often come in contact but has a very painful sting and is very aggressive when protecting the bivouac. E. burchellii can be extremely beneficial when getting rid of household and agricultural pests (Encyclopedia of Life 2013).